Have you ever found yourself in the following situation: you’re in a public place—a doctor’s waiting room, on the bus or train, or even a café—and when you look around to survey the area, most of the people you see are crouched over their portable electronic devices, “in the zone,” with their necks tilted forward and backs arched? If it seems like these occurrences are becoming increasingly regular, or if you’ve noticed yourself being one of those people staring at a screen, it’s safe to say you’re not alone. Text neck is a fairly new diagnosis that’s caused by flexing the neck for extended periods of time, usually from too much time spent looking at a smart phone or tablet. 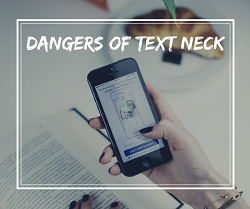 It’s classified as a repetitive strain injury, and in a day when many people spend so much time a day on their devices, the prevalence of text neck is now growing rapidly. Biologically speaking, our necks were not made for texting. Neck muscles and joints can handle our normal everyday movements, but they are not built to withstand being overstretched for countless hours every day. The average human head weighs about 10 pounds in a neutral position (with ears over shoulders), but the further the head tilts forward, the more the pressure increases on the neck. So when you spend much of your free time sending texts or watching the latest viral video, you’re pushing your neck past its limits, and over time, text neck can result. Aside from neck pain or soreness, the condition can also lead to headaches, shoulder, arm or wrist pain. In severe cases, it can even cause muscles to adapt to fit the flexed position, which can reverse the natural curvature of the neck and make it painful to straighten it. With long-term practice in this position, herniated discs of the spine may also occur. At Physical Therapy Doctors of Florida in Bradenton, FL, we understand the importance of smartphones, but we don’t like to see patients in pain from overusing these devices. If you’re experiencing pain or soreness that may be from too much texting, we can help with exercises and other advice on minimizing neck strain. For more information on how to prevent text neck or to schedule an appointment, call us at 941.264.1414.